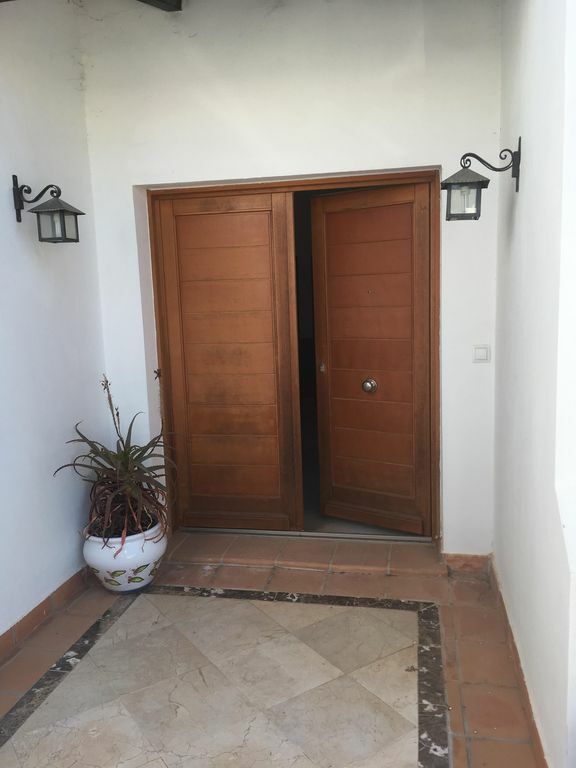 This stunning 3 bedroom villa with 2 bathrooms is built on one level so is great for families, young couples, older couples and is wheelchair accessible. With large terrace areas, built in barbecue and a swimming pool to the rear. This villa really does offer endless luxury and security. El Valle town centre on the resort, consists of a supermarket, Club House, Gym, Golf Shop, bar and restaurant. Also there are Tennis courts on resort near to the town centre. Also to the left of the property there is a tarmacked children's play area with a variety of different apparatus. A number of children's play areas can be found across the resort. En-suite to master bedroom with jacuzzi bath, his and hers sinks. Main bathroom - family bathroom with shower. Dining table to seat 6 people, Lounge seating for 6 people. Kettle, toaster, microwave, American style fridge freezer, dishwasher, cooker with hob. Accommodation located on El Valle Golf Resort, El Valle is quickly becoming THE course in the South East of Spain, with rave reviews from all levels of ability. Polaris World have quickly gained their deserved reputation for offering the best golf in Europe, in collaboration with Jack Nicklaus, they have brought us The Nicklaus Golf Trail, which currently includes El Valle, La Torre, Mar Menor (9 hole) and Hacienda Riquelme. The innovative designs and breathtaking views combine to deliver fresh challenges for all levels of ability, from the beginner to the professional , golfers of all abilities can enjoy all these magnificent courses with the free luxury shuttle buses provided, sit back and relax with a drink at the 19th. There is exceptional value to be had if you wish to book a number of days golf and play up to 6 different courses under one booking. Notes on accommodation: Please contact owner. Outside: Private swimming pool, Sun loungers, barbecue area with dining space for 6 people. Utility Room: Washing machine and dryer, outdoor sink. Cleaning / Towels / Linen / Maid service: 110 Euros is payable upon arrival to cover exit clean, Linen & Meet/Greet on Resort. There is a fee of 10 euros per person also for personal linen. Payment is in euros. Recently returned from this beautiful villa with my husband and four children. Villa is large and airy and very clean. Very comfortable lounge area and well equipped kitchen with all mod cons. Pool area is well equipped with plenty of loungers. Pool was cleaned every couple of days. El Valle resort itself is quiet but there is plenty to do in the area and Sarah the owner was most helpful in recommending day trips etc. We've had a wonderful 3 weeks at the villa. All you would expect and more. The villa is spacious and very comfortable, and the pool is very clean and well maintained. On a quiet road on the resort and not overlooking the golf course, so you don't have golfers coming past your pool every 15 minutes (and no noise either!). The course is well worth playing; not overly long, but well protected by bunkers, and some fabulous tees, especially the 11th, over rocks. Sarah kept in touch before we went and we were well looked after there by Sally and Neil. A car is necessary. Highly recommended! My experience overall has been outstanding; from communicating with the owner Sarah who is the most considerate and patient person letting me ask a million questions and making this the smoothest trip ever to the villa being absolutely perfect and amazing. We struggled with the outdoor shower on the first date and Sarah made sure someone came to check on it; the service and the communication was great! The villa itself is absolutely beautiful with their own private pool, AC all over the house and just small really sweet touches, like basics In the kitchen, lounge chairs, soap. I'll definitely be coming back here next year! Perfectly placed villa, with all you could need..
Just returned from 3 weeks in this beautiful villa! Everything you could need, lovely villa, great pool, bbq, all on a family friendly site! We were very well looked after. Will be returning next year too.thank you! We are pleased to know our guests had a great time. It's a wonderful development for golfers and non golfers alike. A short drive from the airports, close to beaches and to both Murcia city and Cartaghena . Pristine villa , spacious , bright rooms with high ceilings. Pool and bbq area well maintained. Recommend nearby Cartegena for trip. Closest beach to the resort is Los Alcazarez which is only 20 minutes away. Murcia - San Javier airport is 20 minutes from the resort. Alicate airport is 50 minutes from the resort. Activities close-by: Shopping: Nueva Condominia and the Thader Centre(15-20 mins drive towards Murcia). Dos Mares (15-20 mins drive) is a shopping centre in San Javier with a large selection of retail outlets and an extensive food hall. Beach activities include fishing sailing, snorkelling, scuba diving, jet skiing and wind surfing, all can be found within a 20 - 30min drive. Terra NaturaWater park and Zoo will keep the kids entertained and is just a 15min drive from the El Valle resort. El Valle town centre on resort, consists of a Supermarket, Club House, Gym, Golf Shop, bar and restaurant. Also there are Tennis courts on resort near to the town centre. Also to the left of the property there is a tarmacked children's play area with a variety of different apparatus. A number of children's play areas can be found across the resort. Booking Notes: To book accommodation, please contact Michael Doran (details below) A refundable £150 deposit is payable at the time of booking, to be refunded within two weeks of your departure (subject to satisfactory property inspection). Payment to be made via owners direct at time of booking and the full balance must be paid 30 days prior to travel. Changeover Day: Changeover day is Saturday, departure from villa to be before 11am. Arrival in villa to be after 4pm. Notes on prices: Please contact owner.